What we know so far is that two new operators are on their way, one and attacker and the other a defender. It terms of their Siege backstory, they are two operators from the SASR “from way back, [and] they’ve signed up with Rainbow to bring a little Aussie know-how to the other side of the world. This includes a new device that’ll keep roaming Defenders on their toes, and one that’ll leave Attackers at a bit of a loss.” With these Australian operators will come a new desert map that will bring some of their homeland with them. The map will have an Australian gift shop and counter with the nation’s popular delicacies. 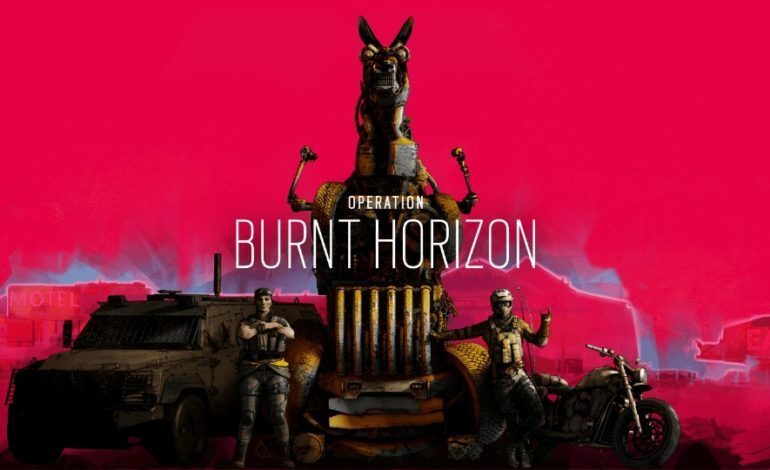 For the last day of the Six Invitation on February 17, the full reveal of Operation Burnt Horizon will be shown to fans and professional players live on the Rainbow Six Twitch Channel. This Montreal event is always an exciting one for dedicated players as it marks a new year and updates along with the spirit of competition. The tournament will begin February 11 with group play; four groups will each have five team. Familiar faces like Team Reciprocity, Evil Geniuses, G2 Esports, and more will be there. Just before the All Star match and Grand Final are played, the Siege team will reveal what the Year Four roadmap has in store. For more information about the Six Invitational’s schedule and Siege content, check out their website.